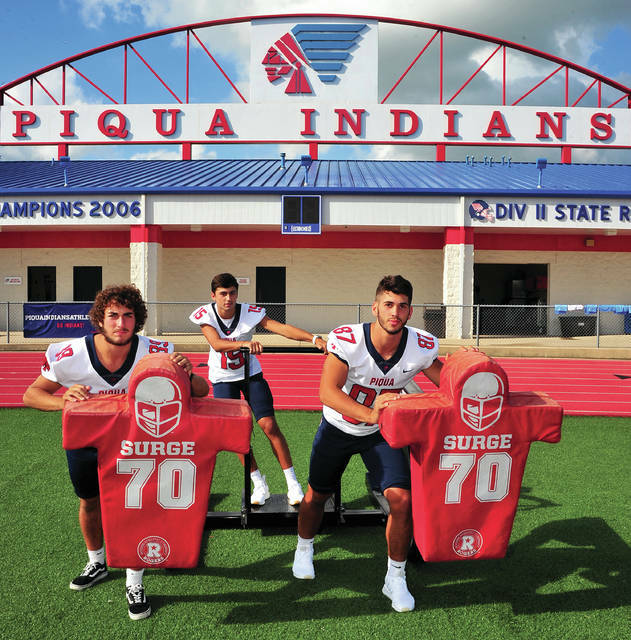 Mike Ullery | Daily Call Cousins Brennan Toopes (89) Owen Toopes (15) and Grant Toopes (87), keep it all in the family as part of the 2018 Piqua Indians football team. Three Toopes are better than one. At least that’s the approach the Piqua football team has taken this season. Cousins Brennan Toopes, Owen Toopes. and Grant Toopes are all senior starters for the Indians. Brennan, (6-foot, 209 pounds) and the son of Pat and April, returns to his starting defensive line position for the Indians after recording 52 tackles and a sack last season and he is also playing at tight end as well. In youth football, Owen was on a different team than Brennan and Grant. Owen (6-2, 171)and the son of Mike and Jody Toopes, is poised for a breakout season at the receiver position, while also starting in the defensive backfield and returning punts and kickoffs. He had 11 receptions for 120 yards and two touchdowns a year ago. For Owen, the youth football games against his cousins were always special. And that hasn’t completely changed on Friday nights. Owen often finds Brennan lined up next to him on offense. “I talk trash with him all the time,” he said with a big smile. But. when the game is over on Friday night, it is over. Grant (6-3, 226) and the son of Brian and Kelly Toopes, has moved into a starting spot on the defensive line as well. He had 11 tackles last year in limited action. And having all three of them out there on defense, gives the Indians a distinct advantage Grant said. And while the season didn’t start the way the Indians hoped — with a 42-22 loss to Chaminade-Julienne — the Toopes have high hopes for the rest of the season. And having three Toopes on the field is a good start. https://www.dailycall.com/wp-content/uploads/sites/30/2018/09/web1_083018mju_fb_phs_toopesboys.jpgMike Ullery | Daily Call Cousins Brennan Toopes (89) Owen Toopes (15) and Grant Toopes (87), keep it all in the family as part of the 2018 Piqua Indians football team.